Camden County Prosecutor Mary Eva Colalillo and Camden County Police Chief Scott Thomson reported a reward is available for information in the killing of a Camden man. Sergio Rivera, 38, was shot multiple times on the 1100 block of N. 21st Street in Camden around 3 a.m. July 18, 2014. 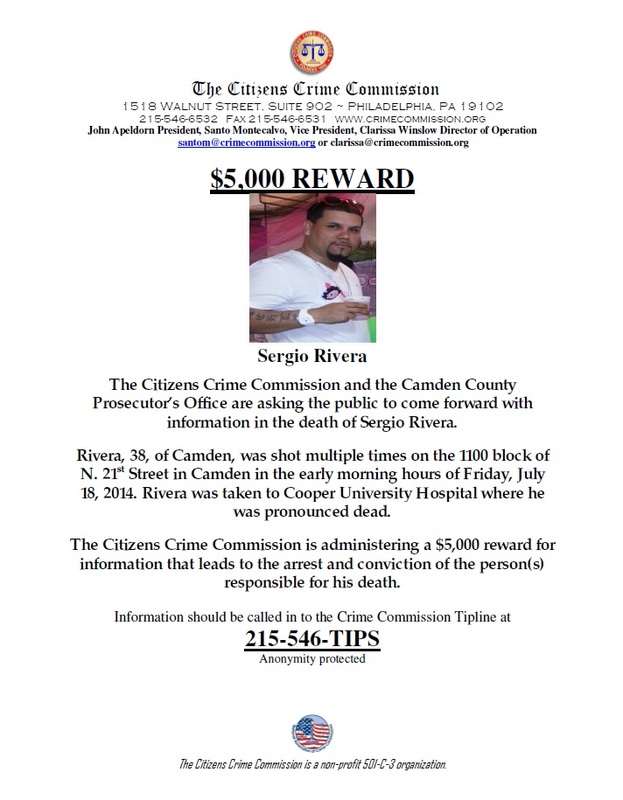 A $5,000 reward for information leading to an arrest and conviction in Rivera’s death is being administered by the Citizens Crime Commission in Philadelphia. Anyone with information on Rivera’s killing is urged to contact Camden County Prosecutor’s Office Detective Michael Rhoads at (856) 225-8561 or Camden County Police Detective Mike Ross at (856) 757-7420. Tips may also be emailed to ccpotips@ccprosecutor.org or texted to CCTIP. Information can be provided anonymously through the Citizens Crime Commission by calling (215) 546-TIPS. Released: Wednesday, November 5, 2014.